In a recent article by Andisiwe Makinana originally posted in the TimesLive, it shows that Ramaphosa’s job approval rating as president dropped to 62% at the end of September from 68% three months ago and Support for the governing ANC also slid from 64% of people who “liked” the party between April and end June to 58% at the end of September. Ramaphoria‚ the elation that engulfed the country since the election of Cyril Ramaphosa as ANC president in December‚ is evaporating. Ramaphosa’s job approval rating as president dropped to 62% at the end of September from 68% three months ago. Support for the governing ANC also slid from 64% of people who “liked” the party between April and end June to 58% at the end of September. 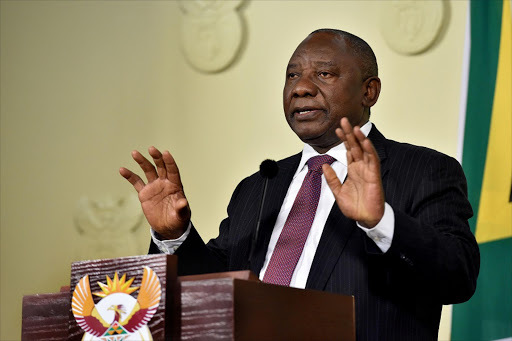 The ANC has‚ however‚ still benefited from Ramaphosa being at the helm of the party and the country‚ according to a new survey published by Cape Town-based research company Citizen Surveys this week. Over the past year support and preference for the party has seen a net growth from 42% to 58% and from 36% to 43%‚ respectively. Results of the survey shows that while Ramaphosa still ranks as the most popular political party leader polled over the past 12 months‚ comparatively speaking his favourability rating has significantly decreased over the third quarter of this year‚ dropping from 64% to 56%. The DA’s Mmusi Maimane’s favourability score remained at 31% where it has plateaued over the past 12 months‚ while South Africans who feel close to the DA have declined slightly since the first quarter of 2018‚ from 8% to 7%. “This is likely the result of the DA’s internal conflicts and the ANC and EFF opposition it faces in the metros it holds‚” found the survey. The EFF leader Julius Malema’s popularity has dropped from 31% in the previous quarter to 29% while over the past two years‚ his popularity ratings have almost doubled from 16% to 29% and his impact on improving the EFF’s image increased from 22% to 39%. The research found that the EFF had a relatively stable core constituency which was mainly young and urbanised black men‚ in contrast with the DA’s diverse and multiracial constituency base. The survey was based on interviews of 3‚900 respondents where 1‚300 adult South Africans were interviewed per month through face-to-face interviews on computer tablets. The results cover the period between July and end September 2018. Meanwhile the proportion of South Africans who believe the country is heading in the wrong direction grew from 55% to 65%‚ while those who believe the country is heading in the right direction dropped from 37% to 28%. “Perceptions around to the state of the economy and the prospects of an economic recovery contributed to the belief that the country is heading in the wrong direction. The biggest challenge for Ramaphosa is whether he will be able to manage this economic crisis and retain the public’s confidence into the 2019 elections‚ as much more time may be needed to fix the deep-rooted problems that face him‚” found the survey. Perceptions of a weakening economy and deteriorating personal living conditions continued in the third quarter of 2018‚ with only one-quarter (26%) of SA adults reported an improvement in their personal living conditions. This indicator has declined since the first quarter of 2018‚ where it stood at 28%. Many South Africans remain hopeful about their personal futures‚ however‚ with about 60% saying they believe that their livelihoods will improve over the next 12 months. There is however slightly less optimism about the national economy’s prospects‚ with 52% of South Africans believing it will improve in the next 12 months. Trust levels in state institutions including those established to support SA’s democracy like the public protector and Independent Electoral Commission (IEC) are plummeting. With just months before the next general elections‚ trust in the IEC dropped to an all-time low of 52% in the last quarter from the highs of 72% after the 2016 local government elections. Reza Omar‚ director of research at Citizen Surveys‚ explained that the drop in trust in the IEC appeared to relate to South Africans being unsure of which other institutions have been compromised by state capture as it started dropping significantly in the second quarter of 2018. “We are working on understanding the phenomena‚ but it is in line with drops in all key institutions‚ so in its general form we can infer that there is a consistent drop in trust in all core democratic institutions. The [third quarter] period is also where state capture featured prominently in the media which may have had an overall impact on trust‚” he added. The survey also found that since Busisiwe Mkhwebane’s appointment as public protector in October 2016 [69%]‚ trust in the public protector’s office has declined to just 47% at present. According to Omar‚ a significant drop in the perception of trust in the public protector was in the second quarter of 2017 and this was also when former President Jacob Zuma implemented the “midnight massacre” cabinet reshuffle which over two thirds of South Africans were against and believed was not in the country’s best interest. The National Prosecuting Authority at 46% of the trust‚ the Constitutional Court (56%)‚ religious (58%) and traditional leaders (35%) are some of the institutions that South Africans do not hold in high regard. Despite the spate of financial mismanagement‚ corruption and state capture allegations‚ just under two-thirds (63%) of South Africans still trust the SABC.